If you’re running virtual machines in your organization, you are more likely to be using VMware or Hyper-V than any Linux based hypervisor. With the number of Hyper-V users increasing rapidly, here are a few tips for you to get started in data protection. Backing up your Hyper-V virtual machines is the best preventive measure you can put up against data threats. It is more than an insurance. It gives you the scope to move back in time to restore your system to a particular point before the threat wiped out your data. Before we jump into the options, let’s take a step back. Virtual machines are contained units that have their hardware configuration, OS and services. When backing up these virtual machines, you can backup each one of them as if it were a separate machine or backup all the virtual machines at once directly from the host. But imagine backing up 10 – 15 VMs manually and individually. It takes a toll on your machine’s I/O operations and on your sanity. Host-level backup- Here, you backup all the virtual machines directly from the host. You use the Hyper-V tools to take a backup of VMs inside it, at once. Your aim is to have a copy of your virtual machine’s files like hardware configuration, operating system, saved-state files, virtual hard disks, and network configuration files to another site. To expand, Cold Backup involves you stopping the virtual machine and copying the files. Although you can script these actions, you will suffer a downtime that feels like forever. When it comes to critical machines that need continuous uptime, this is the least efficient mode of backups. The good thing is that it doesn’t cost you anything. But, as previously said, downtime costs you…indirectly. It makes you wonder, how do I backup my VMs without interrupting operations? Or in other words, how do I perform Hot Backup? Enter Volume Shadow Copy Service. If your guest OS is Windows, you can take the VSS way of backing up your VMs. This further divides into two ways. The virtual machine is basically put into a Saved State before the snapshot processing happens. Or the VSS inside the child VM can also be utilized for backup. Backup Integration Service should be installed in the child VM. The VSS Requestor and VSS Writer coordinate to get a stable image of the VM. Microsoft has System Center Data Protection Manager to backup the virtual machine’s data from the host level. DPM uses block-based synchronization to take a copy of the VM. Using Hyper-V APIs, the DPM determines whether the VMs support VSS. If they do, then Child VM method is used to take the backup and if not, the machine is just stopped to take a snapshot. This host-level backup allows VM-level, file-level and application-level recovery. We’re now at a point in virtualization, where you may be using multiple hypervisors in your environment. You may use VMware. 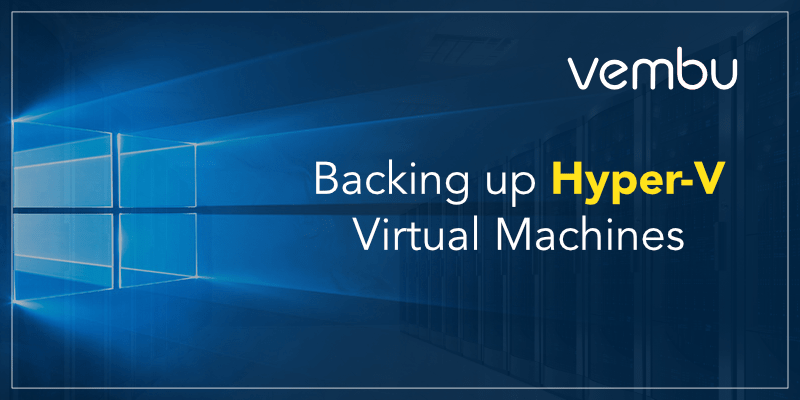 You may have Linux VMs in your Hyper-V environment that you want to backup. You may look for extensive reporting, flexible scheduling and disaster recovery options. When you are looking for so much more than what Hyper-V offers, it is best for you to go for a third party tool. Backup and Recovery is a very competitive market these days. You’ll be able to use a single solution to address many of your backup needs. A native backup solution doesn’t cut it when you have a mixed environment. A third-party solution can give you the flexibility, control and the monitoring options when you have varied data protection requirements. What if you want to backup critical files on a different schedule and backup applications with consistent backups while also going for image-based backups for your physical machines? And while doing all these, you also want to experience agentless backups of your VMs from VMware and Hyper-V hypervisors? As I said, a native solution just doesn’t cut it. Vembu BDR Suite is a portfolio of products designed to backup multiple environments from virtual to physical to cloud while addressing diverse and advanced use cases – all within your budget. Vembu offers this agentless backup of all your critical VMs at zero cost. Check out Vembu Free Edition that may deliver on all your basic backup and recovery requirements.